Remember the blisters you’d get from playing Donkey Kong and Pac Man with the old Atari joystick? And remember the fear of ripping that stick right off the main platform because you can’t get past level 2 in Asteroids? 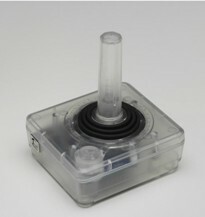 Well get your callused hands ready because the classic joystick is back with a new transparent design. Now the folks at Retro Thing, a blog dedicated to the wonders of yesteryear, have re-fashioned this wrist-twisting classic, and brought it into the modern age. First, it uses USB, so you can hook it up to a new machine. Second, it is clear. Why make it clear, instead of classic black? Because today, every gadget has to have a blue, glowing blinkenlight inside. The Clear Classic USB Joystick has not been made exempt from this awful custom, and lights up as blue as a comedian in a working men’s club. The stick will cost you $30, and once your hands have recovered from the mauling they’ll likely receive on first use, you can pop open the case and make a new housing for the fully removable controller board inside. Don’t have any old-school games to play? Fear not! The joystick ships with a CD full of old games and the Stella Atari 2600 Emulator for Mac or PC.